Bonugli, E., Cormier, J., Reinhart, L.H., Reilly, M.A., Replicating Real-World Friction of Motorcycle Helmet Impacts and its Effects on Head Injury Metrics. SAE Technical Papers, 2017 1:1433. Jones, K.R., Choi, J.H., Sponsel, W.E., Gray, W., Groth, S.L., Glickman, R.D., Lund, B.J., Reilly, M.A., Low-Level Primary Blast Causes Significant Ocular Injuries in Rabbits. Journal of Neurotrauma, 2016, 33(13):1194-1201. Reilly, M.A., Martius, P., Kumar, S., Burd, H.J., Stachs, O., The Mechanical Response of the Young Porcine Lens to a Spinning Test. Zeitschrift fűr Medizinische Physik, 2016, 26(2):127-135. Wilkes, R.P., Reilly, M.A., A pre-tensioned finite element model of ocular accommodation and presbyopia. International Journal of Advances in Engineering Sciences and Applied Mathematics, 2016, 8(1):25-38. Watson, R., Gray, W., Sponsel, W.E., Lund, B.J., Glickman, R.D., Reilly, M.A., Simulations of Porcine Eye Exposure to Primary Blast Insult. Translational Vision Research and Technology, 2015, 4(4):1-11. Reilly, M.A., Villareal, A., Maddess, T., Sponsel, W.E., Refined Frequency Doubling Perimetry Analysis Affirms Central Nervous System Control of Chronic Glaucomatous Neurodegeneration. Translational Vision Science and Technology, 2015, 4(3):1-12. Reilly, M.A., A Quantitative Geometric Mechanics Lens Model: Insights into the Mechanisms of Accommodation and Presbyopia. Vision Research, 2014, 113:20-31. Sherwood, D., Sponsel, W.E., Lund, B.J., Gray, W.M., Watson, R., Groth, S., Thoe, K., Glickman, R.D., Reilly, M.A., Anatomical Manifestations of Primary Blast Ocular Trauma Observed in a Postmortem Porcine Model. Investigative Ophthalmology and Visual Science, 2014, 55(2):1124-1132. Reilly, M.A., Hamilton P.D., Perry G., Ravi N., Comparison of the Behavior of Natural and Refilled Porcine Lenses in a Robotic Lens Stretcher. Experimental Eye Research, 2009, 88(3):483-494. Reilly, M.A., Ravi N., Microindentation of the Young Porcine Ocular Lens. Journal of Biomechanical Engineering, 2009, 131(4):044502. Reilly, M.A., Rapp B., Hamilton P.D., Shen A.Q., Ravi N., Material Characterization of Porcine Lenticular Soluble Proteins. Biomacromolecules, 2008, 9(6):1519-1526. Hogrebe, N.J.; Reinhardt, J.W. ; Tram, N.K. ; Debski, A.C. et al., 2018, "Independent control of matrix adhesiveness and stiffness within a 3D self-assembling peptide hydrogel.." Acta Biomater 70, 110-119 - 110-119. Kotzur, T.; Benavides-Garcia, R.; Mecklenburg, J.; Sanchez, J.R. et al., 2017, "Granulocyte colony-stimulating factor (G-CSF) promotes spermatogenic regeneration from surviving spermatogonia after high-dose alkylating chemotherapy.." Reprod Biol Endocrinol 15, no. 1, 7 - 7. Sponsel, W.E. ; Johnson, S.L. ; Trevino, R.; Gonzalez, A. et al., 2017, "Pattern Electroretinography and Visual Evoked Potentials Provide Clinical Evidence of CNS Modulation of High- and Low-Contrast VEP Latency in Glaucoma.." Transl Vis Sci Technol 6, no. 6, 6 - 6. Balikov, D.A. ; Crowder, S.W. ; Boire, T.C. ; Lee, J.B. et al., 2017, "Tunable Surface Repellency Maintains Stemness and Redox Capacity of Human Mesenchymal Stem Cells.." ACS Appl Mater Interfaces 9, no. 27, 22994-23006 - 22994-23006. Marinkovic, M.; Block, T.J.; Rakian, R.; Li, Q. et al., 2016, "One size does not fit all: developing a cell-specific niche for in vitro study of cell behavior.." Matrix Biol 52-54, 426-441 - 426-441. Wilkes, R.P. ; Reilly, M.A., 2016, A pre-tensioned finite element model of ocular accommodation and presbyopia.. International Journal of Advances in Engineering Sciences and Applied Mathematics 8, no. 1, 25-38 - 25-38. Jones, K.; Choi, J-H.; Sponsel, W.E. ; Gray, W. et al., 2016, "Low-Level Primary Blast Causes Acute Ocular Trauma in Rabbits.." J Neurotrauma 33, no. 13, 1194-1201 - 1194-1201. Reilly, M.A. ; Martius, P.; Kumar, S.; Burd, H.J. et al., 2016, "The mechanical response of the porcine lens to a spinning test.." Z Med Phys 26, no. 2, 127-135 - 127-135. Rex, T.S. ; Reilly, M.A. ; Sponsel, W.E., 2015, "Elucidating the effects of primary blast on the eye.." Clin Exp Ophthalmol 43, no. 3, 197-199 - 197-199. Watson, R.; Gray, W.; Sponsel, W.E. ; Lund, B.J. et al., 2015, "Simulations of Porcine Eye Exposure to Primary Blast Insult.." Transl Vis Sci Technol 4, no. 4, 8 - 8. Sponsel, W.E. ; Reilly, M.A. ; Maddess, T., 2015, "Definitive Response to Denniss and Artes: The Paired Eyes and Brain in One Person Are One Unit.." Transl Vis Sci Technol 4, no. 2, 8 - 8. Benavides-Garcia, R.; Joachim, R.; Pina, N.A. ; Mutoji, K.N. et al., 2015, "Granulocyte colony-stimulating factor prevents loss of spermatogenesis after sterilizing busulfan chemotherapy.." Fertil Steril 103, no. 1, 270-80.e8 - 270-80.e8. Watson, R., Gray, W., Sponsel, W.E., Lund, B.J., Glickman, R.D., Reilly, M.A., 2015, "Simulations of Porcine Eye Exposure to Primary Blast Insult.." Translational Vision Research and Technology 4, no. 4, 1-11 - 1-11. Sponsel, W.E., Reilly, M.A., Maddess, T., 2015, "Denitive Response to Denniss and Artes: The Paired Eyes and Brain in One Person Are One Unit." Translational Vision Science and Technology 4, no. 2, 1-5 - 1-5. Reilly, M.A. ; Villarreal, A.; Maddess, T.; Sponsel, W.E., 2015, "Refined Frequency Doubling Perimetry Analysis Reaffirms Central Nervous System Control of Chronic Glaucomatous Neurodegeneration.." Transl Vis Sci Technol 4, no. 3, 7 - 7. Sherwood, D.; Sponsel, W.E. ; Lund, B.J. ; Gray, W. et al., 2014, "Anatomical manifestations of primary blast ocular trauma observed in a postmortem porcine model.." Invest Ophthalmol Vis Sci 55, no. 2, 1124-1132 - 1124-1132. Sponsel, W.E. ; Groth, S.L. ; Satsangi, N.; Maddess, T. et al., 2014, "Refined Data Analysis Provides Clinical Evidence for Central Nervous System Control of Chronic Glaucomatous Neurodegeneration.." Transl Vis Sci Technol 3, no. 3, 1 - 1. Reilly, M.A., 2014, "A quantitative geometric mechanics lens model: insights into the mechanisms of accommodation and presbyopia.." Vision Res 103, 20-31 - 20-31. Du, H.; Hamilton, P.; Reilly, M.; Ravi, N., 2012, "Injectable in situ physically and chemically crosslinkable gellan hydrogel.." Macromol Biosci 12, no. 7, 952-961 - 952-961. Du, H.; Hamilton, P.D. ; Reilly, M.A. ; d'Avignon, A. et al., 2010, "Corrigendum to "A facile synthesis of highly water-soluble, core-shell organo-silica nanoparticles with controllable size via sol-gel process" [J. Colloid Interface Sci. 340 (2009) 202-208] (DOI:10.1016/j.jcis.2009.08.032)." Journal of Colloid and Interface Science 344, no. 1, 237 - 237. Reilly, M.A. ; Ravi, N., 2010, "A geometric model of ocular accommodation.." Vision Res 50, no. 3, 330-336 - 330-336. Andley, U.P. ; Reilly, M.A., 2010, "In vivo lens deficiency of the R49C alphaA-crystallin mutant.." Exp Eye Res 90, no. 6, 699-702 - 699-702. Reilly, M.A. ; Andley, U.P., 2010, "Quantitative biometric phenotype analysis in mouse lenses.." Mol Vis 16, 1041-1046 - 1041-1046. Reilly, M.; Ravi, N., 2009, "Microindentation of the young porcine ocular lens.." J Biomech Eng 131, no. 4, 044502 - 044502. Reilly, M.A. ; Hamilton, P.D. ; Perry, G.; Ravi, N., 2009, "Comparison of the behavior of natural and refilled porcine lenses in a robotic lens stretcher.." Exp Eye Res 88, no. 3, 483-494 - 483-494. Reilly, M.A. ; Perry, G.; Ravi, N., 2009, "A dynamic microindentation device with electrical contact detection.." Rev Sci Instrum 80, no. 1, 015105 - 015105. Du, H.; Hamilton, P.D. ; Reilly, M.A. ; d'Avignon, A. et al., 2009, "A facile synthesis of highly water-soluble, core-shell organo-silica nanoparticles with controllable size via sol-gel process.." J Colloid Interface Sci 340, no. 2, 202-208 - 202-208. Reilly, M.A. ; Hamilton, P.D. ; Ravi, N., 2008, "Dynamic multi-arm radial lens stretcher: a robotic analog of the ciliary body.." Exp Eye Res 86, no. 1, 157-164 - 157-164. Reilly, M.A. ; Rapp, B.; Hamilton, P.D. ; Shen, A.Q. et al., 2008, "Material characterization of porcine lenticular soluble proteins.." Biomacromolecules 9, no. 6, 1519-1526 - 1519-1526. Nguyen, B.A. ; Roberts, C.J. ; Reilly, M.A. "Biomechanical impact of the sclera on corneal deformation response to an air-puff: A finite-element study." (1 2019). Nguyen, B.A. ; Roberts, C.J. ; Reilly, M.A. "Biomechanical Impact of the Sclera on Corneal Deformation Response to an Air-Puff: A Finite-Element Study.." (1 2018). Kumar, B.; Dasari, R.; Reilly, M.A. "Lens Capsule Strain Modulates Lens Epithelial Cell Proliferation." (7 2018). Nguyen, B.A. ; Roberts, C.J. ; Reilly, M.A. "Preliminary study on biomechanical contribution of the sclera to dynamic corneal response in air-puff induced deformation." (7 2018). Kumar, B.; Reilly, M.A. "Maintaining Epithelial Cell Viability in Whole Lens Cultures ex vivo." in Annual Meeting of the Association-for-Research-in-Vision-and-Ophthalmology (ARVO). (6 2017). Jones, K.; Reilly, M.A. ; Glickman, R.D. "Identification and localization of trauma-related biomarkers using matrix assisted laser desorption/ionization imaging mass spectrometry." (1 2017). Jones, K.; Reilly, M.A. ; Glickman, R.D. "Identification and localization of trauma-related biomarkers using matrix assisted laser desorption/ionization imaging mass spectrometry." in Conference on Visualizing and Quantifying Drug Distribution in Tissue. (1 2017). Bonugli, E.; Cormier, J.; Reilly, M.; Reinhart, L. "Replicating Real-World Friction of Motorcycle Helmet Impacts and Its Effects on Head Injury Metrics." (3 2017). Groth, S.L. ; Sponsel, W.E. ; Reilly, M.A. ; Johnson, S.L. et al. "Binocular inverse correlation of low- vs. high-contrast VEP latency in glaucoma shows association with pericentral vs. midperipheral visual field loss." in Annual Meeting of the Association-for-Research-in-Vision-and-Ophthalmology (ARVO). (6 2017). Reilly, M.A. ; Cleaver, A.; Rede, A.; Rodriguez, L. et al. "Best Practices for Estimating Lens Mechanical Properties Using a Compression Test." in Annual Meeting of the Association-for-Research-in-Vision-and-Ophthalmology (ARVO). (6 2017). Johnson, S.L. ; Sponsel, W.E. ; Trevino, R.; Majcher, C. et al. "Inverse Relationship between Hc & Lc VEP Latency in Paired Glaucomatous Eyes." in Annual Meeting of the Association-for-Research-in-Vision-and-Ophthalmology (ARVO). (6 2017). Trevino, R.; Sponsel, W.E. ; Johnson, S.L. ; Reilly, M.A. et al. "Positive Correlation of High- and Low-Contrast ERG in Glaucoma Patients with Negative Correlation of High- and Low-Contrast VEP Latency." in Annual Meeting of the Association-for-Research-in-Vision-and-Ophthalmology (ARVO). (6 2017). Tram, N.K. ; Reilly, M.A. ; Swindle-Reilly, K.E. "The Presence of Accommodative Tissues Influences the Shape of the Developing Eye." in Annual Meeting of the Association-for-Research-in-Vision-and-Ophthalmology (ARVO). (6 2017). Groth, S.L. ; Sponsel, W.E. ; Reilly, M.A. ; Johnson, S.L. et al. "Binocular inverse correlation of low- vs. high-contrast VEP latency in glaucoma shows association with pericentral vs. midperipheral visual field loss." (6 2017). Reilly, M.A. ; Cleaver, A.; Rede, A.; Rodriguez, L. et al. "Best Practices for Estimating Lens Mechanical Properties Using a Compression Test." (6 2017). Johnson, S.L. ; Sponsel, W.E. ; Trevino, R.; Majcher, C. et al. "Inverse Relationship between Hc & Lc VEP Latency in Paired Glaucomatous Eyes." (6 2017). Kumar, B.; Reilly, M.A. "Maintaining Epithelial Cell Viability in Whole Lens Cultures ex vivo." (6 2017). Trevino, R.; Sponsel, W.E. ; Johnson, S.L. ; Reilly, M.A. et al. "Positive Correlation of High- and Low-Contrast ERG in Glaucoma Patients with Negative Correlation of High- and Low-Contrast VEP Latency." (6 2017). Tram, N.K. ; Reilly, M.A. ; Swindle-Reilly, K.E. "The Presence of Accommodative Tissues Influences the Shape of the Developing Eye." (6 2017). Schnegg, A.; Sponsel, W.E. ; Bone, R.A.; Reilly, M.A. et al. "Bilateral Macular Protection Pigment and Lens Density Status in Recently Operated Unilateral Pseudophakic Patients." (9 2016). Leon, S.; Sponsel, W.E. ; Groth, S.L. ; Satsangi, N. et al. "Probable Central Nervous System Mediated Enhancement of Perimacular Visual Function." (9 2016). Leon, S.; Sponsel, W.E. ; Groth, S.L. ; Satsangi, N. et al. "Probable Central Nervous System Mediated Enhancement of Perimacular Visual Function." in Annual Meeting of the Association-for-Research-in-Vision-and-Ophthalmology (ARVO). (9 2016). Schnegg, A.; Sponsel, W.E. ; Bone, R.A.; Reilly, M.A. et al. "Bilateral Macular Protection Pigment and Lens Density Status in Recently Operated Unilateral Pseudophakic Patients." in Annual Meeting of the Association-for-Research-in-Vision-and-Ophthalmology (ARVO). (9 2016). Watson, R.; Gray, W.; Sponsel, W.E. ; Lund, B. et al. "Simulations of Porcine Eye Exposure to Primary Blast Insult." (6 2015). Watson, R.; Gray, W.; Sponsel, W.E. ; Lund, B. et al. "Simulations of Porcine Eye Exposure to Primary Blast Insult." in Annual Meeting of the Association-for-Research-in-Vision-and-Ophthalmology (ARVO). (6 2015). Sponsel, W.E. ; Reilly, M.A. ; Lund, B.J. ; Gray, W. et al. "Anatomical Manifestations of Primary Blast Ocular Trauma Observed in an Ex Vivo Porcine Model." (4 2014). Reilly, M.A. ; Wilkes, R. "WHOLE EYE MODEL FOR ESTIMATING ACCOMMODATION-INDUCED STRAINS IN THE TRABECULAR MESHWORK." in 15th American-Society-Mechanical-Engineering Summer Bioengineering Conference (SBC2013). (1 2014). Reilly, M.A. ; Sherwood, D.; Watson, R.; Gray, W. et al. "MANIFESTATIONS OF PRIMARY BLAST-INDUCED OCULAR TRAUMA." in 15th American-Society-Mechanical-Engineering Summer Bioengineering Conference (SBC2013). (1 2014). Reilly, M.A. "IS PRESBYOPIA CAUSED BY LENS GROWTH-INDUCED RESIDUAL STRESSES?." in 15th American-Society-Mechanical-Engineering Summer Bioengineering Conference (SBC2013). (1 2014). Reilly, M.A. ; Wilkes, R.; ASME, "WHOLE EYE MODEL FOR ESTIMATING ACCOMMODATION-INDUCED STRAINS IN THE TRABECULAR MESHWORK." (1 2014). Reilly, M.A. ; Sherwood, D.; Watson, R.; Gray, W. et al. "MANIFESTATIONS OF PRIMARY BLAST-INDUCED OCULAR TRAUMA." (1 2014). Reilly, M.A. ; ASME, "IS PRESBYOPIA CAUSED BY LENS GROWTH-INDUCED RESIDUAL STRESSES?." (1 2014). Reilly, M.A. "Is presbyopia caused by lens growth-induced residual stresses?." (12 2013). Reilly, M.A. ; Wilkes, R. "Whole eye model for estimating accommodation-induced strains in the trabecular meshwork." (12 2013). Reilly, M.A. ; Sherwood, D.; Watson, R.; Gray, W. et al. "Manifestations of primary blast-induced ocular trauma." (12 2013). Reilly, M.A. ; Martius, P.; Burd, H.J. ; Stachs, O. et al. "A spinning device for the mechanical characterization of soft tissues and polymers." (12 2011). Reilly, M.A. "Composite phantoms for understanding viscoelastic biomaterials interactions." (12 2011). Reilly, M.A. "Modeling reactive, electrodiffusion-driven, reversible crosslink gradients in polysaccharides." (12 2011). Zhang, J.J.; Reilly, M.A. ; Ravi, N. "Synthesis of hydrogels with mechanical property gradients." (8 2009). Reilly, M.A. ; Zhang, J.J.; Ravi, N. "Designing transient mechanical property gradients in ionic hydrogels." (8 2009). Reilly,Matthew,A; Zhang,Jingie,J; Ravi,Nathan "Designing transient mechanical property gradients in ionic hydrogels." (8 2009). Reilly,Matthew,A; Zhang,Jingie,J; Ravi,Nathan "Designing transient mechanical property gradients in ionic hydrogels." (1 2009). Zhang,Jingie,J; Reilly,Matthew,A; Ravi,Nathan "Synthesis of hydrogels with mechanical property gradients." (8 2009). Zhang,Jingie,J; Reilly,Matthew,A; Ravi,Nathan "Synthesis of hydrogels with mechanical property gradients." (1 2009). Rapp,Brian; Reilly,Matthew,A; Hamilton,Paul,D; Ravi,N "A comparison of the viscoelastic properties of porcine crystallins and OH terminal PAMAM dendrimers." in 231st National Meeting of the American-Chemical-Society. (3 2006). Reilly, M.A., Fultz, G.W., Gschwender, L. "An Analysis of Weight Change in Filters." (1 2006). Reilly,Matthew,A; Ravi,Nathan "Equibiaxial stretching device for the determination of polymeric film properties." in 231st National Meeting of the American-Chemical-Society. (3 2006). Reilly,Matthew,A; Ravi,Nathan "Equibiaxial stretching device for the determination of polymeric film properties." (1 2006). Rapp,Brian; Reilly,Matthew,A; Hamilton,Paul,D; Ravi,N "A comparison of the viscoelastic properties of porcine crystallins and OH terminal PAMAM dendrimers." in nt. (1 2006). Reilly, M.A. ; Ravi, N. "Equibiaxial stretching device for the determination of polymeric film properties." in 231st National Meeting of the American-Chemical-Society. (3 2006). Rapp, B.; Reilly, M.A. ; Hamilton, P.D. ; Ravi, N. "A comparison of the viscoelastic properties of porcine crystallins and OH terminal PAMAM dendrimers." in 231st National Meeting of the American-Chemical-Society. (3 2006). Rapp, B.; Reilly, M.A. ; Hamilton, P.D. ; Ravi, N. "A comparison of the viscoelastic properties of porcine crystallins and OH terminal PAMAM dendrimers." (3 2006). Reilly, M.A. ; Ravi, N. "Equibiaxial stretching device for the determination of polymeric film properties." (3 2006). Reilly, K.E. ; Thobe, S.M. ; Jiang, P.; Soltisz, A.M. et al. "Development of Therapeutic Hydrogels for Traumatic Optic Neuropathy." in Society for Biomaterials Annual Meeting. "Viscoelastic Behavior of the Lens Soluble Proteins." in Association for Research in Vision and Ophthalmology, Annual Meeting. 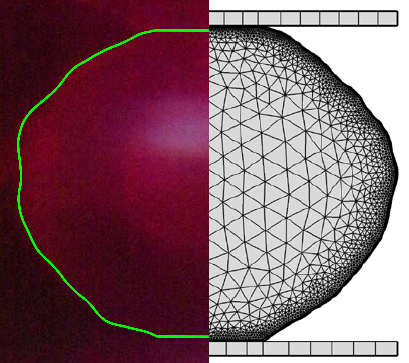 "Volume Decrease of Schlemm's Canal in an FEA Model of Elevated IOP in the Human Eye." in Biomedical Engineering Society, Annual Meeting. Reilly, M.A., Perry, G., Ravi, N. "A Robot for Biaxial Characterization of Bioviscoelastic Solids." in American Institute of Chemical Engineers, Annual Meeting. "The Role of Annular Tissues and Intraocular Pressure in Ocular Morphogenesis." in BMES. "Development of Hydrogel Therapeutic Delivery System for Traumatic Optic Neuropathy." in BMES. Reilly, M.A. "Is Presbyopia Caused by Lens Growth-Induced Residual Stresses." in American Society of Mechanical Engineers Summer Bioengineering Conference. Tram, N.K. ; Reilly, M.A. ; Reilly, K.E. "The Presence of Accommodative Tissues Influences the Shape of the Developing Eye." in ARVO Annual Meeting. Tram, N.K. ; Reilly, M.A. ; Reilly, K.E. "Accommodative Tissues and Intraocular Pressure as Mechanical Determinants of Ocular Morphogenesis: A Finite Element Analysis." in Engineering in Healthcare: Industry and Research Symposium. Reilly, M.A., Zhang, J., Ravi, N. "Transient Elasticity Gradients for Studying Cell Mobility." in American Institute of Chemical Engineers, Annual Meeting. Tram, N.K. ; Reilly, K.E. ; Reilly, M.A. "The Ciliary Body as a Determining Factor in Eye Development: A Computer Simulation Study." in Midwest BME Regional Conference. Tram, N.K. ; Reilly, K.E. ; Reilly, M.A. "The Role of Annular Tissues and Intraocular Pressure in Ocular Morphogenesis." in BMES Annual Meeting. Reilly, M.A., Sherwood, D.,Watson, R., Gray, W.M., Sponsel, W.E., Thoe, K., Lund, B.J., Glickman, R. "Manifestations of Primary Blast-Induced Ocular Trauma." in American Society of Mechanical Engineers Summer Bioengineering Conference. Reilly, M.A., Wilkes, R. "Whole Eye Model for Estimating Accommodation-Induced Strains in the Trabecular Meshwork." in American Society of Mechanical Engineers Summer Bioengineering Conference. Reilly, K.E. ; Tram, N.K. ; Reilly, M.A. ; Jones, K.R. et al. "Development of Hydrogel Therapeutic Delivery System for Traumatic Optic Neuropathy." in BMES Annual Meeting.